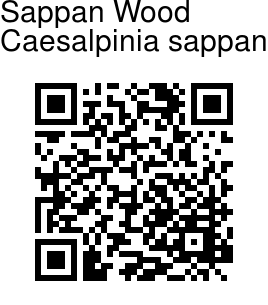 Sappan Wood is a small thorny tree, 6-9 m in height and 15-25 cm in trunk diameter with a few prickly branches. 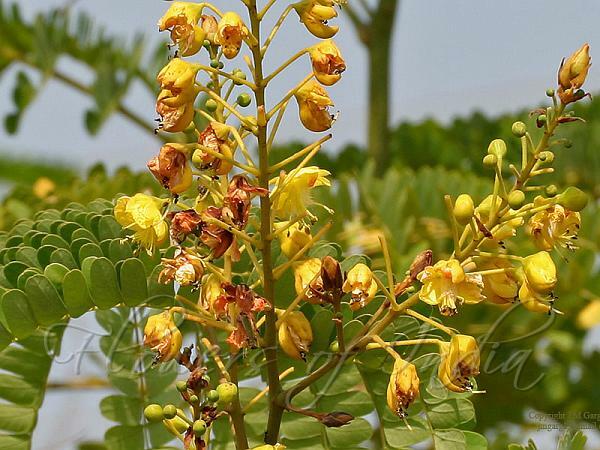 Leaves are double-compound, alternately arranged, 20-45 cm long, 10-20 cm broad, with 8-16 pairs of up to 20 cm long side-stalks. Side-stalks are prickles at the base and with 10-20 pairs of oblong, 10-20 mm x 6-10 mm long leaflets, very oblique at base, rounded to notched at the tip. Yellow flowers are borne panicles in leaf axils and at the end of branches. Flowers fragrant, 2-3 cm long, 5-merous. Stamens are waxy-white, filaments densely woolly at the base. Fruits are woody pods, compressed with a hard recurved short beak, with 3-4 seeds. The heartwood which is used in medicine is light yellow when freshly cut, but it quickly changes to red. The color diffuses out easily in hot water. In about 7-10 hours the extract becomes deep orange in color. Sappan-wood was a major trade good during the 17th century, when it was exported from Southeast Asian nations aboard red seal ships to Japan. Photographed in Herbal Garden, Hyderabad, Andhra Pradesh.